November 08, 2017 | Submitted by: CityScapes Inc.
A company’s lobby area is where visiting customers gain their first impression of a business and its brand. What the customer experiences in those first few minutes can potentially influence the success of a deal or sale. It’s important therefore this space is well-designed and organized, as well as welcoming and pleasant. Lobby spaces, especially large ones, can sometimes seem bland, empty, and even overly corporate. For some businesses, this is the opposite of what they want to portray as a progressive and friendly organization. Yet there’s a simple way to fix this. Foliage-covered trellis screens bring the beauty of nature into the hub of a corporate environment and bring a wide range of additional benefits. Natural plant life provides a softening element to straight-lined commercial interior settings, whether open plan office spaces, walkways, or foyer areas. We’ve written before about the benefits of more greenery in the business environment. These benefits include better air quality, increased customer wellbeing, improved energy conservation, and enhanced employee performance, among other things. And these benefits also apply to commercial lobbies. From the moment a customer enters a premises the interior design needs to align with their expectations of that business. The lobby should positively influence how they think, what they do, and the way they perceive the company’s abilities, standards, and ethos. By creating an aesthetically beautiful and welcoming entrance area the company increases the likelihood of that all-important favorable first impression. Trellis screens adorned with plants, placed in logical and functional locations, can go a long way in making a corporate lobby space a lot more appealing. Greenery covered screens provide an attractive natural barrier with which to subtly break up overly large lobby spaces. A lobby interior can fulfil multiple functions. Screened areas allow for these different functions to take place simultaneously without negatively impacting on one another, while still remaining in the same overall space. Trellises can also influence a client’s journey from the entrance doors through to the rest of the building. The trellis screens act as transitional elements guiding visitors from one area to another, based on pre-determined movement pathways. For example, when used as a decorative feature they can subtly influence where people focus their attention and thereby their movement. Many lobbies have waiting areas where visitors wait after leaving the reception desk. Natural foliage trellis frameworks can provide a sense of privacy for these areas, especially in larger spaces, while still retaining an audible and visual connection with the rest of the lobby. They can also hide restroom and utility entrances. Wall trellis screens can break up large lobby wall surfaces that might otherwise look plain or even ugly. Wall-mounted wish-mesh frameworks allow for beautiful green foliage to grow up the walls and offer a more affordable aesthetic option compared to mosaics or other expensive decorative features. Lobby areas surrounded by glass walls can potentially suffer from an excess of natural daylight, especially when sunny. This might negatively impact on where waiting areas and reception desks are situated. Foliage covered trellises provide natural shading screens, with an attractive dappling effect, for those areas that catch the sun. Foliage screens absorb sound and muffle ambient noise. As a result, they reduce sound reflections and echo effects common in big interior spaces. Trellis screens attached to walls or as space dividers help reduce sounds within the lobby interior, especially crowd noise. Trellis screens provide a range of benefits for any type of commercial setting but they can be used to their full decorative and functional effect in spacious corporate lobbies. And this is just one of the functions our NatureScreen® product range can fulfill. 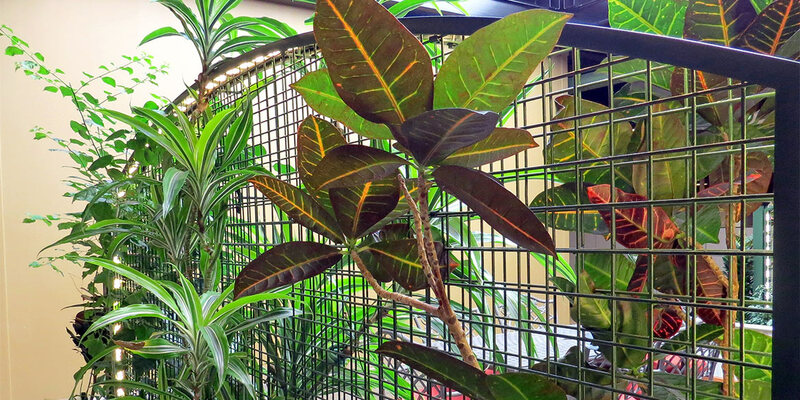 Our wire-mesh trellises will bring the beauty of nature into the space where great first impressions are made.